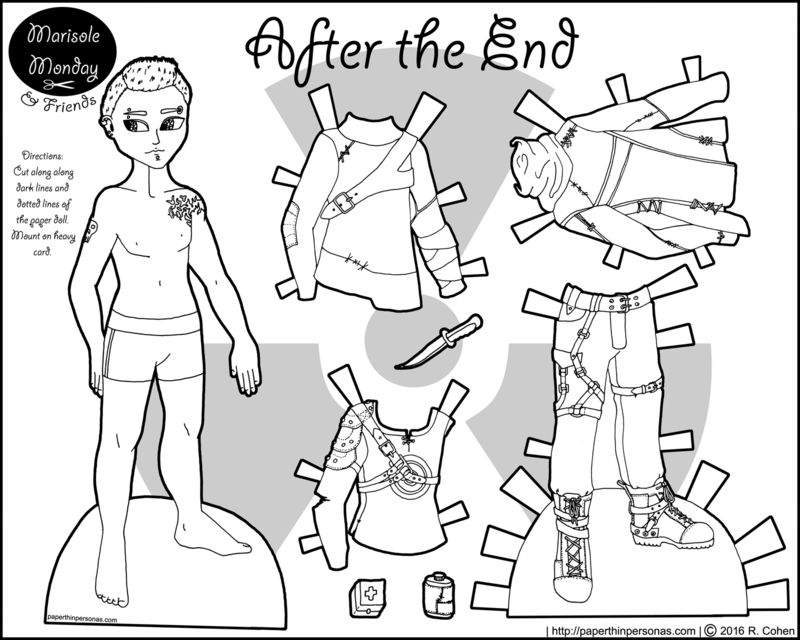 So, I owe a big thank you to Kitrona who back in my suits set for the guys where I was busy complaining about how I never know what to draw for male paper dolls, she suggested post-apocalyptic. Duly inspired, I sketched out this set a few weeks ago. It came together fast, mostly because I was out of Marisole Monday & Friend’s backlog with my last post and I desperately needed to get it done or I would have had nothing to post this morning. And that would have been sad. Today, the guy paper doll is Mikhail. this only the second Mikhail set. Perviously, he was a knight. Here’s a guide to all the Marisole Monday & Friend’s paper dolls. I know sometimes people have trouble sorting out that series and I totally get it. I mean, I live with them, y’all just have them come visit. I really should give Mikhail some more normal clothing- for when he’s not struggling to survive the end of the world and/0r fighting dragons, but I find modern guys clothing so boring. Yeah, I’ve complained about that before. I know. Last, but not least, I always love to read comments, so please feel free to let me know what you think of today’s guy paper doll. I feel like since Marcus got the casual modern set, Mikhail could go hipstery with the tshirt with vest and scarf combo. I’m really loving his chest tattoo. This is so creative! I’m not normally a “bad boy” kind of person, but the piercings, tattoos, and hair are really cool. Can’t wait to see this in color! I love your paper dolls! I’ve been printing them up for a few years now and I’m so excited about “after the end”!